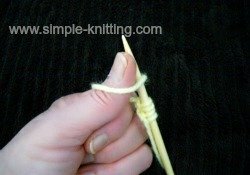 The single cast on knitting method is also called the thumb cast on, and backward loop cast on. Whichever way you want to call it, it is one of the easiest ways of casting on in knitting. It's so easy in fact that it's often used for teaching kids how to knit. The single cast on is very handy and it's really useful when you need to add a few stitches to your knitting. A knitting pattern may ask you to cast on a couple of stitches around the neck area of your pattern or at the underarm section. This is the go-to cast on to use as it's fast and easy. This is when I use it the most. It's also a nice cast on method for lace projects because it doesn't create much of an edge so it won't interfere with your lace stitches like other bulkier cast ons. Personally though, it isn't my favorite cast on but I do know lots of knitters that love its simplicity. Why? I find that the first row can be a little difficult to knit as the stitches tend to tighten up on the knitting needle. And if your tension is very loose you may end up with a row of loopy stitches. You just have to go slowly. Once you get through the first row everything will be fine. First of all start by making a slip knot. If you aren't sure how to make one you can review how to make a slip knot here. 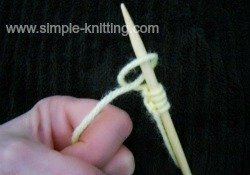 Begin by holding your knitting needle with the slip knot in your right hand. Grasp the working yarn (ball end) in your left hand and grasp it with your fingers. Place your thumb over the yarn. 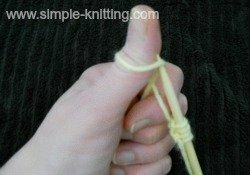 Bring your thumb down to loop the yarn around your thumb and bring your hand back up to an upright position. 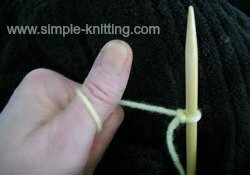 With your knitting needle in your right hand insert it below the yarn at the base of your thumb using an upward motion. Then just remove your thumb leaving the new loop on the knitting needle. 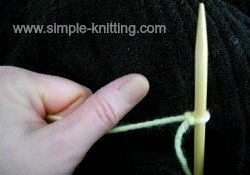 When the loop is on the knitting needle just gently pull it until it is snug on the needle - not too tight. Continue until you cast on the amount of stitches you need. And for those of you who prefer watching, here's a great knitting video demonstrating this cast on method. When you're done casting on stitches you'll be all ready to start learning how to knit! Now the real knitting fun begins.